When life gives you lemons, drink tequila, as the saying goes. 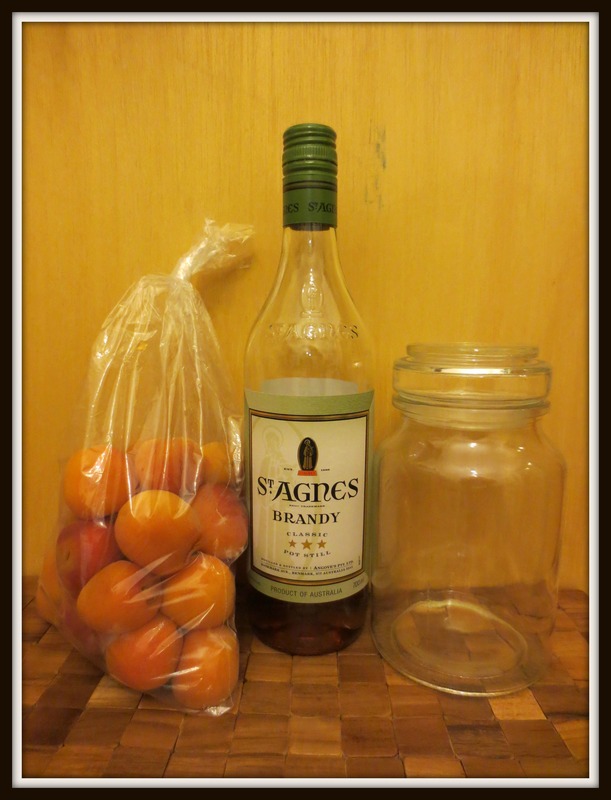 When you find a bag of apricots for $1, make apricot brandy, as the slightly-less-well-known saying goes. To make apricot brandy you’ll need apricots, brandy, sugar, a clean glass jar and a secret ingredient that we can’t show you here. How annoying. I’ve been experimenting with infusing alcohol with various flavours – fruit, coffee beans, chilli, spices – for a few years. Some have been good, some have been disasters. (Let’s not talk about that stupid attempt to make Hendrick’s by bunging some cucumber into a jar of low-grade gin, OK?) I read somewhere once that when you’re infusing things with alcohol, you shouldn’t leave it for too long or it will go a bit bleargh. So I said much the same in a previous post about making peach vodka. Turns out I was wrong; it depends on what you’re infusing. Oops. A friend gives me a bottle of fruit-infused spirits every Christmas. Her creations have included apricot brandy, strawberry-vanilla vodka and passionfruit rum. I loved her apricot brandy so much I hid it from 52 Cocktails’ CTO (Cocktail Tasting Officer) and only allowed myself a small glass on a special occasion (luckily, I consider most days to be a special occasion). That was a few years ago and I still wish I had some left. 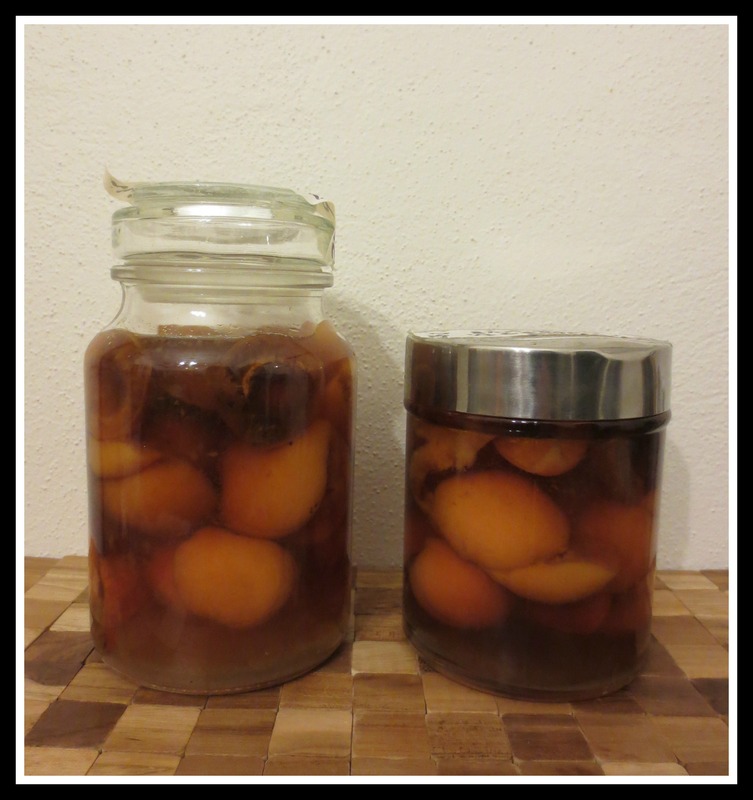 So when I bought a bargain bag of apricots recently I decided to re-create her apricot brandy. Can’t be that hard, I thought. Slice the apricots, bung em in a jar, add sugar and brandy, and store in a dark place for a week, right? After that initial week, I taste-tested my creations (for the record, one jar had St Agnes three-star brandy with brown sugar, and the other had St Agnes VSOP with white sugar). The VSOP version was OK, but not great; the other was sort of muddy (I think that’s because of the brown sugar). Nothing like hers. Somehow her infusions are closer to liqueurs than spirits; her strawberry-vanilla vodka is almost like drinking liquidised jam, it’s so flavoursome. In comparison, mine were kinda crap. I had a shot of her strawberry-vanilla vodka to make myself feel better, but it only made me feel worse because clearly SHE is an expert and I am not, even though I am the one with a shelf full of cocktail books and my own cocktail site and so therefore I know everything, and it’s not faaaaair, and how come hers are so good, and…. Damnit. I want apricot brandy NOW. If you’re as impatient as I am, I suggest you buy your apricot brandy. If you have the patience of a saint, here’s how to make your own – according to my pal, since SHE’S the one who knows what she’s doing! Halve enough fresh apricots to half or 2/3 fill a clean glass jar. Discard the pips. Add a cup of white sugar and 700ml brandy. Screw on the lid, shake the jar a bit to help dissolve the sugar, store it in a dark place and leave it the hell alone for MONTHS. If you think of it, shake it every few weeks. And in the time it takes for Australian political parties to sort themselves out and start governing instead of sniping at each other, you’ll have a superb apricot brandy. Because it turns out, the longer you leave a fruit infusion, the stronger the flavour will be (it seems so obvious now… *facepalm*) Strain it through muslin into a clean glass jar and either eat the fruit (though not for breakfast unless you plan on being drunk the entire day) or use it in a recipe. There are recipe ideas and more info about infusing fruit here.